Now is the time to consider a house washing. Along with brighter days, warmer temperatures and good feelings, Spring is the time to tend to our homes. This is why in the mid-19th Century, the term “Spring Cleaning” came into common use in England. It wasn’t long before the tradition spread to Australia. Our ancestors began the Spring cleaning habit, giving their homes a thorough scrubbing every year. Temperatures warm enough to open every window, but with no pesky flying insects. At this time of the year, spring cleaning should not stop at the interior walls of your home. Now is the time to consider Spring Cleaning the outside of your home. Scott from Waterworx Pressure Cleaning says, ” Spring is the best time to wash the outside of your house. This gets the mould under control before the hot humid days arrive”. Waterworx Pressure Cleaning & House Washing offers an extensive variety of services that will help get a home’s exterior in top shape this spring. Services include pressure cleaning driveways, patios, pool areas and decks as well as power washing roofs and soft house washing. The pressure cleaning services offered by Scott and his team of highly trained technicians are safe, fast, effective and environmentally friendly. Waterworx Pressure Cleaning & House Washing is a nationally recognised expert in pressure cleaning. With a fleet of state-of-the-art equipped service trucks out on the road, Waterworx Pressure Cleaning & House Washing offers unparalleled speed of service. The professionals who staff those vehicles are fast and they also know house washing. 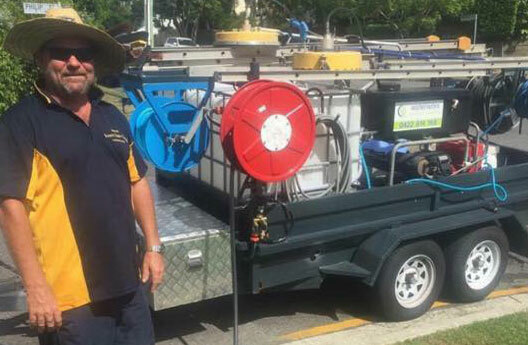 Scott and his team have washed the walls & roofs of over 5,000 homes in South East Queensland. As for concrete and driveway cleaning Scott and his team have cleaned over 2 million square metres of concrete. Soft House washing removes dirt, grime and mould without damage to the surface. Waterworx Pressure Cleaning’s exclusive Safe Pressure Soft Wash Roof Cleaning process begins with an application of an algaecide solution. Safe for people, pets and the environment, this algaecide solution kills the algae and mould on roofs. As winter turns to spring mould quickly grows, leaving unsightly black and green streaks. Scott and his staff are experts in mould removal. They apply a second application to doubly ensure unwanted mould is completely eliminated. Each application contains a special additive to inhibit future algae growth and keep your roof looking newer, longer. Despite its great strength, concrete is a very porous material. Debris and water can cause considerable damage when trapped in the tiny pores below the surface. This is why concrete cleaning is so important. Waterworx Pressure Cleaning & House Washing protects the concrete in driveways, patios and other areas around the home. A three-step process is used starting with the application of a cleaning solution. This is followed by pressure washing and then, finally by the application of an anti mould treatment. The anti-mould treatment aligns itself near the top of most porous surfaces, like concrete. The anti mould treatment acts as a shield, protecting against dirt, water and contaminants, yet allowing the concrete to breathe. Giving your home’s exterior a spring cleaning with Waterworx Pressure Cleaning & House Washing will not only enhance its appearance, it will also protect your family by removing potential health hazards posed by contaminants – and it will save you money too. For example, cleaning your roof should reduce cooling costs in the summer by removing algae, which, being dark, absorbs heat. Of course, cleaning the exterior of your home can also make you money. According to the National Association of Realtors, Soft Washing a house before putting it on the market can increase value by up to $15,000. Waterworx Pressure Cleaning & House Washing will help you realise the benefits of home exterior cleaning quickly and easily. Using their professional service saves money! Do-it-yourself options that call for using rented equipment just do not do the job and can be a long chore. Using professionals like Waterworx pressure cleaning will finish your cleaning job faster. This is a good thing, as it will give you more time to get out an enjoy the party nature throws every year during our beautiful South East Queensland Spring. Waterworx Pressure Cleaning Service Brisbane, Ipswich, Logan & Gold Coast. Call us today on 0422814168 or fill out the quotation form below.